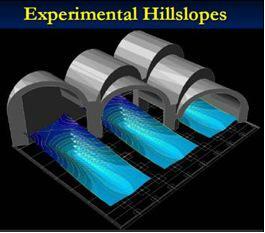 Each hillslope experiment, like the three pictured here, involves a 360-square-meter area. The experiments at Biosphere 2 will involve three side-by-side hillslopes subjected to different rainfall amounts over at least three years. Factors that might affect how a hillslope evolves are the density and type of plants growing on the hills. Troch expects to be able to measure distinctive changes in the way these hillslopes evolve. How do soils, climate, and plants interact to affect the landscapes of the semi-arid southwest? That’s what Professor Peter Troch, from the University of Arizona’s Department of Hydrology and Water Resources, and other Biosphere 2 scientists aim to find out. It seems like a basic question, but it’s one that hasn’t been answered—in part because it requires the long-term, coordinated interaction of geologists (studying soil formation), hydrologists (studying water movement), climatologists (studying atmospheric effects), ecologists (studying the role of plants and micro-organisms), and a whole host of other scientists (many of them students) to do the biogeochemistry, field measurements, and modeling necessary to understand the evolution of a hillslope. One advantage to doing research at Biosphere 2 is that it’s possible to control some environmental factors, such as precipitation and temperature, over a large area. Scientists are good at conducting research in their comfort zone: at a small scale and on a narrow topic. But truly interdisciplinary science at this scale is rare.